Keywords: Academic performance, Health related quality of life, Mental health, Physical health. Objective: To determine health related quality of life (HRQOL) of medical students and its correlation with their academic performance. 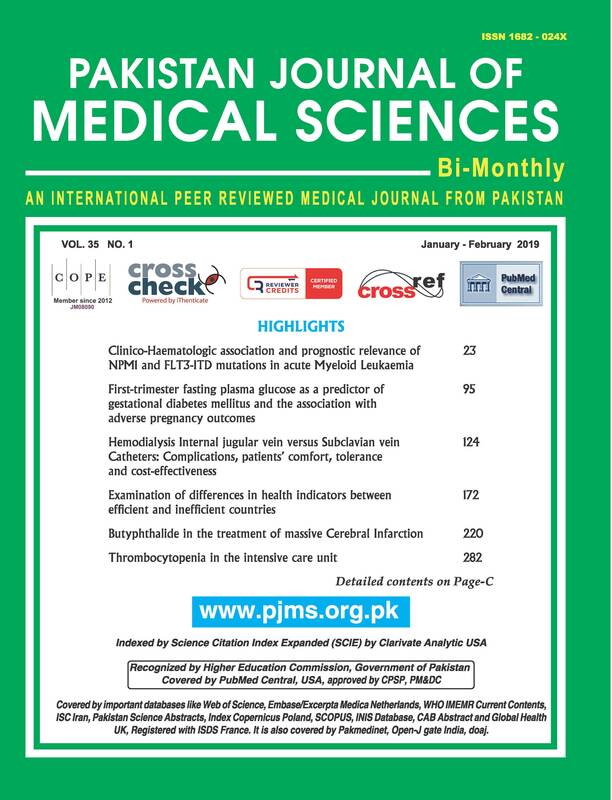 Methods: Cross sectional study at Services Institute of Medical Sciences, included students of 4th and final year MBBS, who filled SF-36 proforma of HRQOL. Scores of 8-domains and of physical component and mental component summary were determined. Marks in all professional examinations were used to stratify students as high performers (≥ 70% marks) and average performing students (< 70%). HRQOL scores was correlated with academic performance using unpaired student’s t-test. Results: Among 267 students included, mental health score (56.2±21.3) was lower than physical health component score (69.03±18.5). Role limitation due to emotional health (RE) (44.81), Vitality (VT) (54.19) and general health perception (GH) (58.89) had lower scores among 8domains of questionnaire. Female students had significantly lower scores in role limitation due to emotional problems (p value <0.04), vitality (<0.05), bodily pain (p value <0.05) and general health perception (p value<0.03) than male students. Physical health and role limitation due to physical health domains were better in high performing students. Conclusion: Mental health of medical students is suboptimal, especially among female students. Students with better physical health have better academic performance.